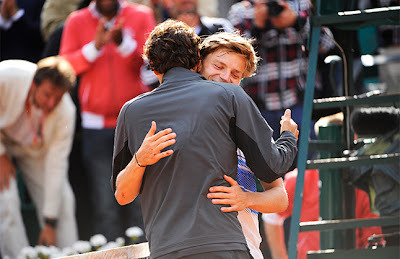 Goffin will likely remember this match for the rest of his life. The final 8 in Paris was set on Sunday and Monday, and all the victors were no real surprises. Novak Djokovic, Rafa Nadal, Roger Federer, Andy Murray, Jo-Wilfried Tsonga, David Ferrer, Juan Martin del Potro, and Nicolas Almagro all got through. Only Djokovic, Federer, and Tsonga were really threatened at all. 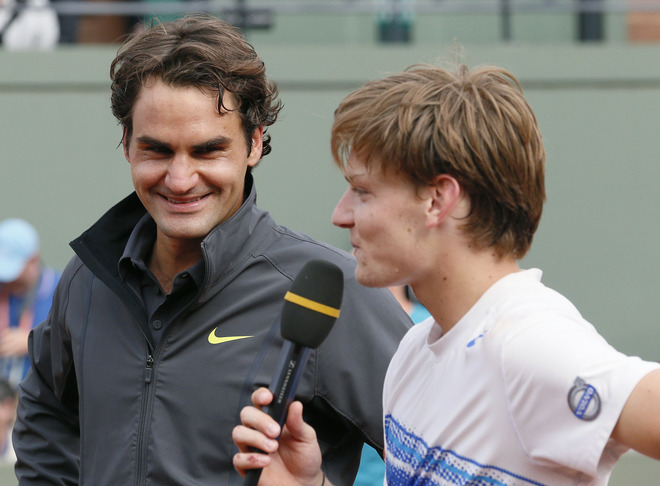 Roger Federer had a tougher go of things than expected against Belgian lucky loser David Goffin, who idolized Fed growing up. Surprisingly, the young, skinny 21 year-old took the first set 7-5 after playing some spectacular unsuspecting tennis. The youngster kept the pressure on the 16-time Slam champion in the second set and was up 15-30 at 4-5, attempting to create shocking headlines. Roger got his feet back under him, however, and won the next three games to take the 2nd set 7-5. Speaking of Djokovic, he nearly went out to Italian Andreas Seppi, going down two sets to none before prevailing 46 67(5) 63 75 63 in almost 4 hours of play. Djokovic claimed himself that nothing went right but he just kept believing and that is what got him through the day. I knew that Nole hadn't been exactly easing through the first three rounds, but I was still shocked to see that he needed 5 sets to get by Seppi. Jo-Wilfried Tsonga gained revenge on Stan Wawrinka (who defeated him last year) by recording a 5-set win over the Swiss. Tsonga took a two set lead to start the match, but just like last year, Stan came rolling back and took the next two sets. Darkness halted play when Jo was up 4-2 in the fifth and they resumed the next day, where Stan broke right back and got to 4-4 before Jo broke in the 10th game of the set to advance to his first French Open quarterfinal. Richard Gasquet did not have the same luck on his side. After blowing past Andy Murray in the first set of their encounter, the Scot roared back with some inspired play and handily took the match in the next three sets, 16 64 61 62. It was probably some of the sharpest tennis I have ever seen Andy play overall, not just on clay. It was a masterclass over the final three sets. Nicolas Almagro waits for Rafa in the quarterfinals (fun prize to get for making the quarters!). Nico was "technically" the underdog against Tipsarevic, being the lower seed, but he is the far better clay courter, and won 64 64 64 without much hassle. Like Rafa, he has not dropped a set in the tournament thus far. Another guy who hasn't dropped a set yet is David Ferrer, who dismissed Marcel Granollers easily 63 62 60. As I predicted, Juan Martin del Potro defeated Tomas Berdych in 4 sets. Delpo went up two sets to one before darkness came, and then went up a break in the 4th when play resumed, only to have Tomas break back and even it up. That was not to last as the Argentine broke in the 12th game to win the match, 76(6) 16 63 75. Roger has beaten Delpo 4 times in 2012 and 5 since last summer, and has taken 11 straight sets against the big man. However, del Potro is very dangerous and Roger knows that, and he cannot be underestimated. He did take Roger to 5 three years ago, and even though he has seemingly gotten "owned" by Roger this year, anything can happen. Fed will have to improve his level of play from the first four rounds if he hopes to make his 31st Grand Slam semifinal in his past 36 Grand Slams. Both Djokovic and Tsonga will be coming off five-setters. Both know each other, and both generally play well when they face off. Jo has the firepower to beat Novak, especially with the way Nole looks to be struggling in the movement department at the moment. The question is whether his head will hold up or not. I expect Djokovic to win but it won't be easy. Two years ago, Rafa was tested by the fiery Spaniard in two tiebreaks, ultimately winning 76 76 64. Rafa is looking remarkable at the moment, and there is no way anybody should pick Almagro, but I think Nico will be able to steal a set. If he tested Rafa two years ago, he can do it again now, when he is much better and more confident. He has also played a fine tournament so far. This is a match where both guys are playing sensationally well. Ferrer has breezed through his first four matches and Andy, while struggling initially, looked ridiculously good against Gasquet. This is a toss up to me, but I think Andy will take it in the end, maybe in 5.